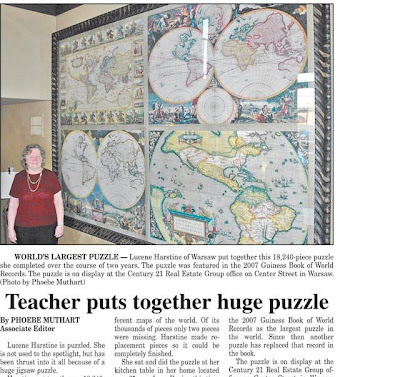 Lucene Harstine, Grace College alumnus and wife of former Grace Brethren pastor Richard Harstine, recently completed a two-year project assembling one of the world’s largest jigsaw puzzles in her home in Warsaw, Indiana. Read about it by clicking here. This is a difficult puzzle, and a task most people would not have the patience or space for!! You are to be commended for seeing it through to a 'done'. mounting it is not easy either...is it? It's great to see that it is displayed on a wall. You should find this easier - as you are experienced now, plus the distinct colors/sections aid assembly...and there are no difficult borders to deal with. ...are you game? ... we'd love to put you in our Hall of Fame if you do! Again, congralutions on completing the maps!